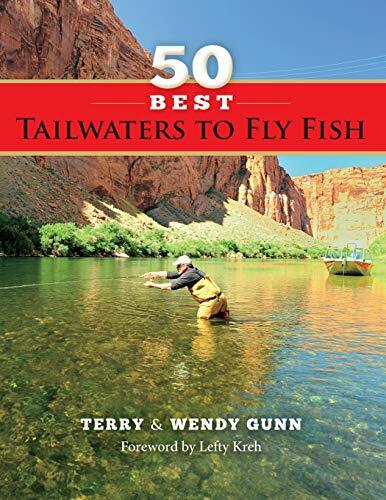 The first book to look at the very best tailwater fisheries across the U.S. and Canada, from Terry & Wendy Gunn - fly-fishing icons, and owners and operators of Lees Ferry Anglers, on the Colorado River below Glen Canyon Dam. Each chapter is written by an expert outfitter or guide for their featured tailwater chapter, including contributions from such seminal figures in the sport as Pat Dorsey, Craig Mathews, Mike Lawson, Tim Linehan, and others. Detailed GIS maps accompany each tailwater, and suggestions for gear, lodging, dining, and more are highlighted. Seasonal hatch charts are included where appropriate, and over 200 four-color location photographs appear throughout. Terry was born and raised on a farm in Oklahoma. When not working on the farm, he was always fishing in one of the local creeks, rivers or ponds. His grandfather, Troy Holsted, was a devoted fan of Zane Grey and decided in the 1930's that if Zane Grey was a fly fisherman, then Troy Holsted should also be a fly fisherman. In the 1960's, his grandfather built a cabin in Taylor Park, Colorado and Terry spent his early years walking the high mountain streams watching his fly fishing mentor cast a Montague cane fly rod to rising fish. Every summer Terry still walks the same streams casting the same rod followed by his son, Troy.Terry Gunn is co-owner and founder of Lees Ferry Anglers Fly Shop and Guide Service and Cliff Dwellers Lodge in Marble Canyon. Terry has been a full-time fishing guide since 1983 and is an internationally recognized fly fishing expert, author, photographer, and speaker. Terry has fished around the world in both fresh and saltwater. In 1986, he co-founded Crystal Creek Lodge, considered by many to be one of Alaska's finest fly-out fishing lodges. He also started Baja Anglers, a fly fishing charter boat operation and retail store in Cabo San Lucas, Mexico. He is a consultant to several leading manufactures of fly fishing equipment and fishing lodges. He has held or holds 10 IGFA world records, all on flyrod both fresh and saltwater.Terry's wildlife and fly fishing photographs have appeared in most all of the outdoor magazines as well as books, journals, newspapers, calendars and brochures. He is a recognized author and has published many technical as well as destination fly fishing articles for several magazines.Terry and his wife Wendy are the co-hosts of Fly Fish Television Magazine, an educational fly fishing show that has aired on Fox Sports National and International, the Outdoor Channel and currently airs weekly on the Outdoor Life Network. They also have two videos, an Introduction to Fly Fishing and an Introduction to Fly Casting. Terry was the photography host for the television series, America's Outdoor Journal. In addition, he has appeared on scores of other fly fishing shows including In Search of Fly Waters, Fly Fishing the World, Fly Fishing America and Fly Fishing Video Magazine. Terry and his wife Wendy competed in the first ESPN Great Outdoor Games in Lake Placid, NY.